Note: These Sensors Require an M12 Extension Cable to Connect the Sensor to Your Instrumentation. Omega's M12 Thermocouple probes are a convenient way to measure the temperature in your process. These thermocouple probes are available as Type K thermocouples with Inconel 600 sheaths or 304 Stainless Steel Sheaths. 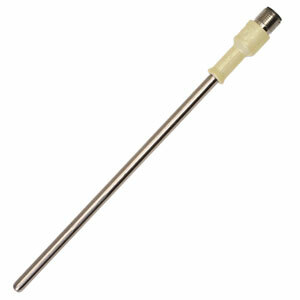 Type J, T and E thermocouples are offered in 304 Stainless Steel Sheaths. Standard probe sizes include 1/4" & 1/8" diameter probes 6" long standard, and 3mm & 6mm diameter probes 150 mm long. These thermocouples can also be provided in other lengths. The sensor can be used as-is or mounted into your process using one of Omega's line of Compression Fittings. The thermocouple compensated M12 connector offers a quick and reliable method for connecting this sensor to your instrumentation. The M12 connector on these sensors is wired in accordance with the pin out shown in the accompanying figure. This pin out matches the wiring provided on Omega's Molded M12 Thermocouple Extension Cables so that the IEC or ANSI color code is maintained between the sensor and your instrumentation. A selection of Omega's M12 Extension Cables are included in the ordering table below. Thermocouple Output conforms to Special Limits of Error per ANSI/ASTM E230. Fractional sizes are 1/4 and 1/8 inch diameters with standard length of 6 inches. Metric sizes are 6mm and 3mm diameters with standard lengths of 150 mm. Insulation Resistance is 1 gigohm minimum at 100 VDC for ungrounded sensors. Connect your M12 thermocouple probe to one of Omega's wide variety of in-stock controllers, data loggers, hand held thermometers, PLCs or other measurement or process control products to complete your measurement or control system. For Grounded Junction probe, change "U" to "G" in model number with no change in price. For Dual element probes, add "-DUAL" to the end of the Model Number and multiply the price by 1.75. For longer length Type J, 304 Stainless Steel sheathed probes, change the "-0600" or "-0150" in the model number to the required length and add $0.50 per inch (or 25mm) to the price. For longer length Type K, Inconel 600 sheathed probes, change the "-0600" or "-0150" in the model number to the required length and add $0.65 per inch (or 25mm) to the price.